It’s not just the railroads. From college campuses to supermarkets and airport terminals, unrest is simmering across France. Against the backdrop of the national public railway strike — a highly symbolic struggle that, by all indications, promises to be long and intense — students and workers in other sectors are taking actions of their own. 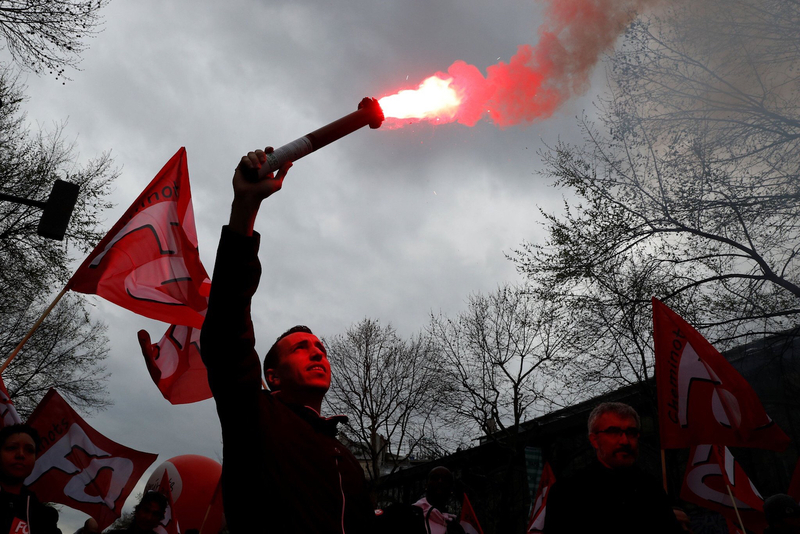 This isn’t the first significant unrest under President Emmanuel Macron — his labor reforms last year were opposed by strikes and days of action — but the current wave is broader in scope. A weekend strike at France’s largest employer, supermarket Carrefour, was followed by strikes on the trains and at airports at the start of this week that have severely impacted transport in the country — and now a burgeoning student movement is joining in support. It’s far from clear whether these various protests will coalesce into a unified movement. They remain largely isolated for now. But the potential for what French left-wing activists term a “convergence of struggles” is becoming increasingly difficult to ignore. Here’s an overview of the situation. After joining civil servants in protest on March 22, rail workers across France kicked off rolling strikes Tuesday. Unions are calling on the government to abandon proposed reforms that would cut worker benefits and inaugurate what they see as the first phase of a full-scale privatization of the national publicly owned rail system, the French National Railway Corporation (SNCF). Under strike plans, workers will engage in a series of two-day job actions separated by three-day intervals until June 28. The strikes are backed by all four major unions. That includes the CGT, the largest union at the SNCF, according to the most recent round of professional elections, as well as the more moderate CFDT and UNSA unions. The more radical SUD-Rail, the third-most popular union at the SNCF, has called on workers to decide strike plans themselves in daily general assemblies. The rank and file participated heavily in today’s action. According to the SNCF, 34 percent of the company’s 150,000 employees went on strike — about the same as the 35 percent who went on strike March 22. That figure counts white-collar workers as well. On the other hand, 48 percent of employees “indispensable to the circulation of trains” went on strike Tuesday, including 77 percent of conductors. Together, they brought the rail system to a standstill: just one of about every eight scheduled TGV trains was in service; only one of every five regional trains was available. Likewise, the suburban rail system of Paris was running at about a quarter of usual capacity. Strike participation is still a far cry from 1995, when railroad and public sector industrial action brought national transit to a halt and beat back proposed retirement reforms from the government. At that time, about 60 percent of SNCF employees took part in strikes. With significant disruptions and delays affecting commuters, public opinion will likely prove critical to the outcome of the strike. Rail workers are trying to frame their struggle as a broader defense of public services, which remain highly valued in France. Macron and his government, on the other hand, are trying to paint rail workers as a “privileged” fraction of the labor force hanging on to unreasonable benefits. Public opinion has seen a shift in favor of the unions: in a poll published April 1, 46 percent said they thought the strikes were “justified,” up from 42 percent just a couple weeks prior. Like the strike participation levels, both unions and the government will be following these numbers closely. In the meantime, other strikes are bubbling up across the country. Last weekend saw a nationwide strike at the supermarket Carrefour, France’s largest private sector employer, organized in response to the announcement of 2,400 layoffs and nearly three hundred store closures earlier this year. According to unions, the actions affected three hundred stores across the country. Workers were also upset by meager bonuses, which average €57 euros this year, compared to €610 last year. Shareholders, on the other hand, received €345 million in dividends in 2017. It remains unclear whether further job actions will follow. Waste collectors also launched a long-planned, open-ended strike on Tuesday, under the banner of the CGT. Affiliated unions are calling for workers, some of whom are in the private sector, to be recognized as public sector workers. They’re also demanding the possibility for early retirement and reduced working hours. Picket lines went up in the suburbs of Paris, with the CGT claiming significant participation in the west and north as well. There is unrest at Air France, too, another hotbed of union militancy. On Tuesday, pilots, stewards, and grounds crew went on strike for the fourth time since the end of February, calling for a pay hike of 6 percent. While the company has sought to divide unions during negotiations, organized labor has maintained a united front thus far. About a third of the workforce has participated in the recent wave of action. On Tuesday, the company said it could guarantee three of every four flights. Further strikes are set for April 7, April 10, and April 11. In a move clearly designed to put pressure on the government as it pursues rail reform, the CGT also put in official strike notice for a three-month period in the energy sector, coinciding with strikes at the SNCF. The CGT is the largest union in the partially privatized energy sector, which covers France’s nuclear plants and electric grid. Calling for an end to the deregulation of the sector, the union warned of targeted blackouts and decreases in production. However, the CGT won’t be mobilizing workers every day for the next few months — it has stressed the strike notice simply allows employees to go on strike. Public sector protests on March 22 were a flicker of the sort of broader working-class unity that is likely necessary for rail workers to win their face-off against the government. That day, civil servants went on strike against a pay freeze and looming job cuts. In Paris, tens of thousands of protesting teachers, nurses, and rail workers converged at the Place de la Bastille. Unions plan to meet this evening to announce further strike plans. This could lay the foundation for a nationwide movement. Finally, there is mounting unrest on college campuses. While it had mostly subdued since Macron took office last May, the student movement has grown in strength and visibility over the last few weeks. Earlier this year, the government approved a plan to overhaul undergraduate admissions procedures, authorizing public universities to reject prospective students in certain fields. For left-wing student activists, the reforms cross a red line and threaten the essence of the French higher education system with its emphasis on low cost and open access. While the admissions reforms have been known for months, the spark for recent mobilizations came from the southern city of Montpellier. On March 22 — the day of nationwide rail and civil servant protest — law students at the University of Montpellier were holding a general assembly in an occupied lecture hall when a group of masked men barged in, beat them with batons and wooden planks, and kicked them out. In a bizarre twist, the dean of the law school was subsequently taken into police custody and forced to resign, raising suspicions that he was aware of the attack. Another professor has been questioned as well. Students in Montpellier have occupied the school since then, and solidarity actions have spread to other campuses: to Bordeaux, Nancy, Nantes, and elsewhere. Students in Toulouse have held protests and occupations for the last few months against both local and national-level reforms. Meanwhile, the undergraduate campus of one of France’s largest public universities — the University of Paris 1, Panthéon-Sorbonne — remains occupied and blockaded. The Sorbonne itself is frequented by graduate students and has escaped unrest for now, but fifty years after May 1968, the parallels are self-evident. Back then, police repression of the student movement served as a powder keg for an unprecedented rank-and-file worker uprising. While organized labor and the Left are both immeasurably weaker today, young activists are less concerned about these sorts of details. They’re hoping May 2018 will be filled with more than just commemorations.